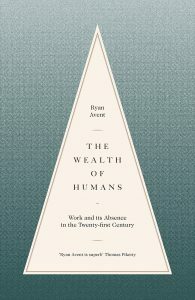 The other strand of the book looks at the recipients of the economics prize since its launch in 1969. The argument is that the dominance of Assar Lindbeck on the awarding committee meant the kind of economics that was recognised took a market turn of its own in the1990s with the recognition of Robert Lucas, Robert Merton & Myron Scholes, Ronald Coase and Gary Becker. One of the problems with the book’s thesis, however, is that so many of the winners have clearly not been free marketeers. Indeed, the recipients have arguably tended more strongly toward the maverick free thinkers than in the profession as a whole, and there have certainly been many ‘liberal’ (American sense) winners. Think of Herbert Simon, Joe Stiglitz, Paul Krugman, Robert Solow, Robert Shiller, Elinor Ostrom, Amartya Sen, Daniel Kahneman ….. There are a couple of chapters calculating the ideological leanings of the winners, and it shows the left ahead of the right for all but the periond 1990-97. This figures: the high tide of free marketry in the profession was the 1980s, and significant proponents were awarded the prize about a decade later. As the book notes, the character of economics (in the world of research at any rate) has changed substantially since then. So if anything, these calculations suggest that to the extent the existence of a prize gave economics ‘scientific’ credibility, it was a liberal, institutionalist, historically and psychologically rich kind of economics! The other point is that there are few, if any, winners who would not be acknowledged by other economists (however grudgingly) as significant intellectual pioneers. Even if you disagree with their political leanings or their economic models, the prize is no mickey mouse affair. In sum, an interesting book for the economics community, but one whose argument did not convince me. Interestingly, the early reviews quoted on the back of this edition make it clear that it was seen at first as a book about economic methodology, specifically price theory, rather than a book setting out economics in equations, which is how it was introduced to me back in the day. Rather optimistically, Samuelson also says in the introduction that whereas every educated person used to need to know their Milton and Hazlitt, Greek and Latin, now they should read a mathematical exposition of basic economic theory. Although the book ran to many editions, I suspect it has had few readers who were not economics students. Fewer still these days – all the editions available on Amazon seem to cost a minimum of around £50, though there’s a $40 edition on Amazon.com. 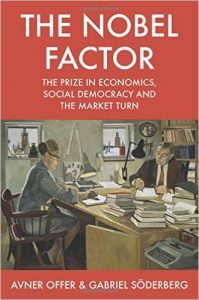 I just started reading The Nobel Factor: The prize in economics, social democracy and the market turn by Avner Offer and Gabriel Soderberg. I thought it was going to be more or less a history of the economics Nobel prize – which pedants always want spelled out as the Sveriges Riksbank Prize in Economic Sciences in Memory of Alfred Nobel. Judging from the introduction and 1st chapter, it is more about the role awarding the Nobel prize played in the increasing orientation of economics as a subject toward the free market version emphasising deregulation and individualism. The book points out that “abstract theory peaked in the 1980s” – but the legacy of the deliberate ideological use of rational expectations/real business cycle economics has lingered in the policy and political worlds to this day. The book’s first chapter demolishes these macro models, rooted in ‘microfounded’ general equilibrium models, describing them as ‘surreal’ and ‘lacking respect for reality’. What I’m interested to find out is how the authors argue the Nobel Prize assisted this turn, for many of the recipients were somewhat maverick, working against the tide – think of Herb Simon, or Danny Kahneman, James Tobin and Robert Solow. 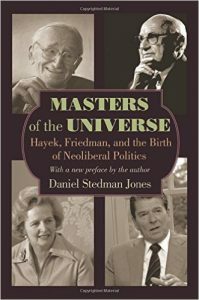 Anyway, it looks like a good companion to Daniel Stedman-Jones’s account of the Mont Pelerin Society and its acolytes in right wing think tanks, Masters of the Universe. The Nobel Factor might have caught the moment. Paul Romer’s excellent paper about the state of macroeconomics has made waves. Simon Wren-Lewis has made some interesting points about it. 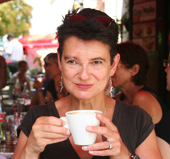 There is an excellent Beatrice Cherrier tweetstorm about rational expectations, well worth looking up. The ESRC is looking to create a macroeconomics network encompassing non-mainstream approaches. Eight years after the crisis, the moment for this debate has arrived. 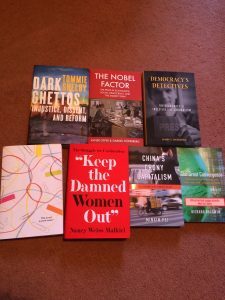 All of a sudden a wave of enticing-looking books has arrived. I’ve read the proofs of Tim Harford’s new one, Messy – not allowed to review that until closer to publication date in early November, but it’s terrific of course. I need to hold off on Richard Baldwin’s The Great Convergence, which I’m desperate to read, because it also isn’t published until November. But all of these others look tempting too. Which to pack in my bag today?